When we arrived at Bugnay Junction, which was just a sign on the edge of the road that listed nearby villages with arrows pointing in their directions, it was mid-afternoon. 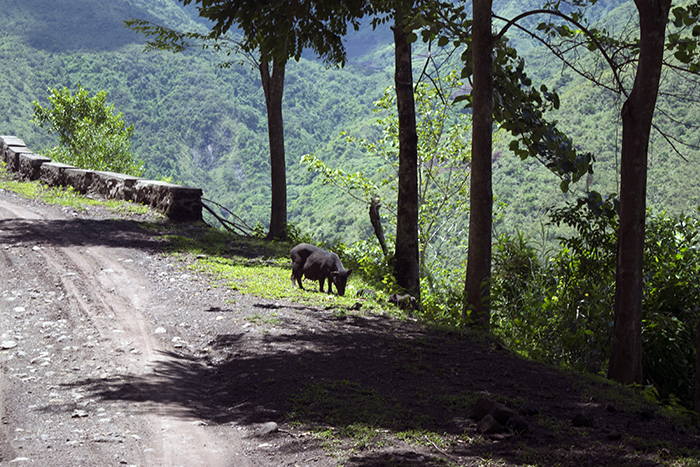 The arrow to Buscalan Village led up a steep dirt path and into the trees. And so Tom, Craig, and I began our climb under the hot sun. It was a strange, beautiful hike; there were no other signs, so we just kind of followed the most worn path, hoping we were going the right direction. We passed a pack of wild boars and the little piglets squealed and ran away when they heard us coming. Over one cliffside we found ourselves looking down at a valley with a single hilltop in the middle, and on that, a schoolhouse. Children waved up at us. After about an hour, we passed by a school that several teenagers were leaving. One boy was walking the same way as us. Craig struck up a conversation and we found out that his name was Ralley, he was 15-years-old, and he lived in Buscalan Village. When we told him that’s where we were headed, his eyebrows pinched together in confusion and he looked us up and down. “Where is your guide?” He asked. We told him we didn’t have one. “How will you find the village?” He asked. We all shrugged. “You will come with me,” Ralley told us. And that’s how we found our guide. 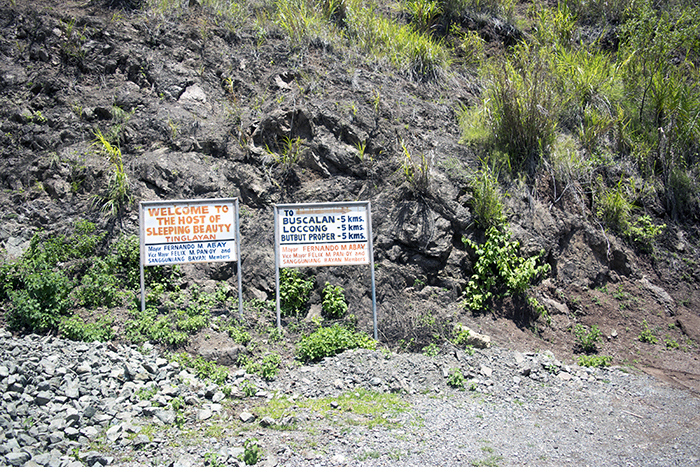 As our trek grew steeper and we veered off the main path, and thru the rice terraces, it became very clear that without Ralley, it might have been near impossible to find Buscalan. We clambered over thin sections of cracked cement, the only thing between us and a steep drop down. We traveled through wooded areas where the path was more of an implication than an actuality. And we even ended up detouring at a waterfall just below the village for a quick swim. The cool water felt perfect after spending so much time hiking through the heat. I didn’t have a bathing suit, so I just waded around in the water up to my thighs and took photos as Ralley, Tom, and Craig took turns jumping off different ledges and into the shallow pool at the bottom. Afterwards, we all dried off, lounging on a shaded, slanted rock. 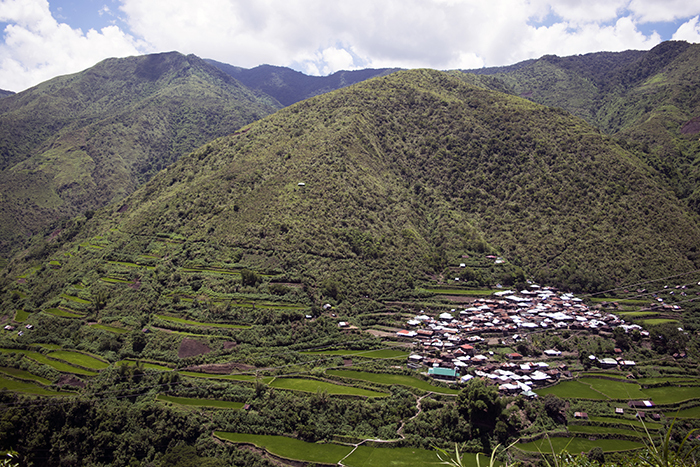 Then, Ralley took us the rest of the way up to the village, climbing up steep steps between the bright green rice paddies until we finally reached Buscalan.